I want to eat a little healthier than I have been, so I decided to try something new for lunch: instead of a sandwich, I’m going to try salad. 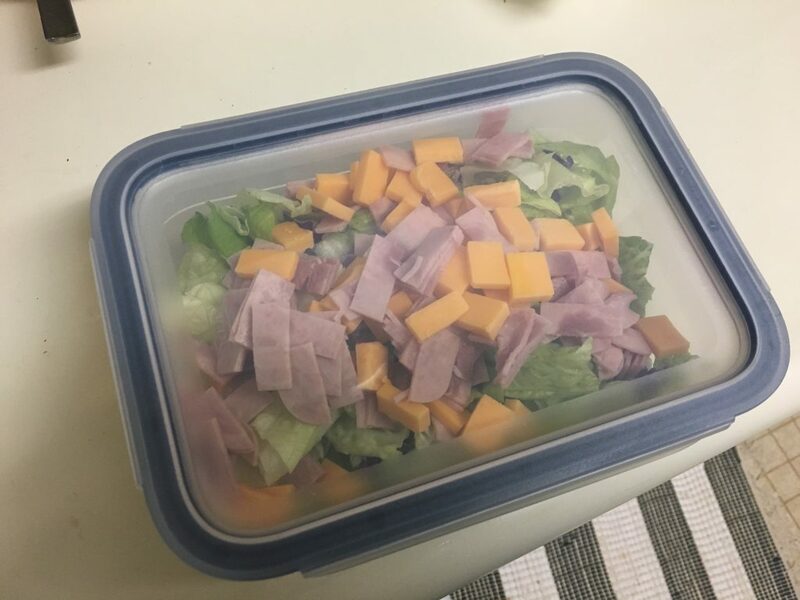 I’ll still eat ham and cheese, but instead of putting it on bread, I’ll cut it up in little pieces and put it over lettuce. It takes longer to make and longer to eat. It does taste good. If I had longer than ten minutes to eat lunch, I would really enjoy it. I am taking it for lunch again today. But then my salad streak will be over. Tomorrow I head to Camp Keanae with the fifth graders for their oudoor ed experience. I’ll be eating whatever we have for lunch there. From my experience last year, there isn’t much of a phone signal there, so hopefully I can make a post. I am a fan of salads with hearty stuff involved. Yours looks delicious, but you’re right about it taking a long time to eat. Maybe you could puree it and make a ham & cheese smoothie? Mmmmm…. smoothie…… Don’t forget the croutons. Hopefully!?!?! Not sure I could handle it if there is not post Brad!